Today is the ALDUB Fifth Weeksary. Everyone is still having the hangover from this noontime addiction. Everyone is tuned in to Eat Bulaga’s KalyeSerye. The ALDUB KalyeSerye dubbed as #KiligPaMore is perhaps the most successful spin-off of their hit segment Juan For All All For Juan (Bayanihan of the People). What started out as simply a sideshow for Wally Bayola’s new alter-ego, Lola Nidora, ended up creating a new love team. YayaDUB and Alden Richards. Seriously who would have expected a love team breaking the internet? En route to the ALDUB Fifth Weeksary, the collective bag of giddiness in Alden Richards and YayaDUB have been exploding the internet. Twitter in particular. And it’s simply not a series of retweets, favorites and copy RT’s. People are really talking about it. It makes non-Filipinos unaware of the proverbial storm that the ALDUB euphoria has caused. And some fans are pretty blunt in admitting that they enjoy seeing Twitter explode. Filipino Dubsmash Queen Maine Mendoza herself is overwhelmed at the reception that came with being paired with Alden Richards. That one time that she smiled at the thought of Alden made the audience think that YayaDUB may not be as snobbish as she was initially presented. YayaDUB and Lola Nidora may be characters largely out of improv theater. But these two characters know how to assume their roles well. Surely, Wally once in awhile ends up suppressing his laughter to keep his character Lola Nidora consisted to the upper-class image projected. But when YayaDUB forget to be snobbish at the sight of Alden Richards? A new love team is born. The ALDUB Fifth Weeksary has commenced as of this writing. Soon enough, there are more and more people viewing Eat Bulaga. Some have been watching to see what comments would Lola Nidora and YayaDUB would provide to the EB Problem Solving segment. But at the same time, they would also watch YayaDUB smile at the sight of Alden. Here is a girl who knows how to smile and get giddy after all. That is despite a watchful eye under her employer, Lola Nidora. Lola Nidora may be more of an employer to her. She might have been the closest thing that YayaDUB has to a mother/grandmother figure. She doesn’t call her Senora after all. She calls her “Lola” (Grandmother). Long before the ALDUB Fifth Weeksary came along, the Eat Bulaga crew has been viewing how can they keep “ALDUB” interesting. Noontime programming is already competitive on itself. Rival program Showtime would often take pride in trending worldwide. Then the ALDUB tandem came along by accident. By accident? Yes, it’s by accident. Not that Eat Bulaga is regretting that from happening now. Putting up a variety show can be hard too. The creative process is like having the materials and facing the adhesive board. You throw whatever idea or material you have on the board and see what sticks. That’s how the brainstorming process works. Had Eat Bulaga ignored YayaDUB’s smile at the sight of Alden, they could have missed a landmine. No ALDUB Fifth Weeksary either. Much of Eat Bulaga’s success has been dependent on comic timing implied on improvisation. Which is why improv theater is constantly mentioned in the several times that this website has discussed ALDUB. It’s about throwing lines and expect the other person to know what to say in reply that is just as funny. Wally first tasted success as the other half of the comic tandem Jose and Wally. Even when they sported their alter-egos, Lolo and Lola (not Nidora, someone older though). Much of the dialogue consisted of adlibs. Now that Wally is allowed to create his own characters outside the Jose and Wally tandem, he hit it big. And this also shows in the ALDUB FIfth Weeksary that the ALDUB euphoria has crossed the line to drama. It was totally unexpected for some viewers. For a KalyeSerye that the world has tuned into, they did not expect to cry along with the characters they fell in love with. Yes, that includes Lola Nidora. Wally is an underrated actor with the capacity to deliver believable emotions. He does not pretend to feel something. If you have watched the ALDUB KalyeSerye long enough, you know how the adlibs included some complaints. Like how Lola Nidora’s voice never got well. Or how for much of the series, she’s been screaming in frustration. And then, on August 21, 2015, the ALDUB FIfth Weeksary, the world shed tears along with Lola Nidora and Alden. 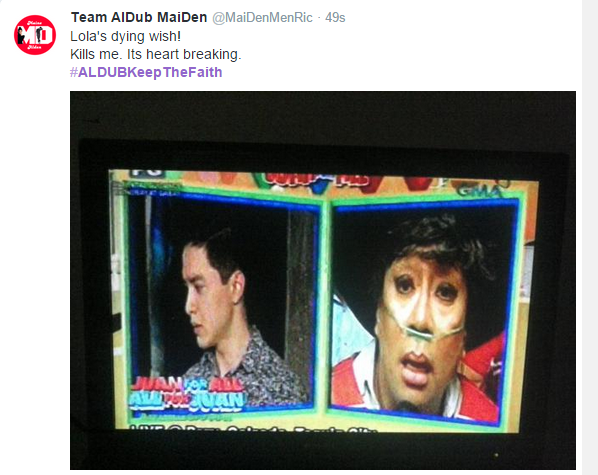 It took a life-threatening illness for Lola Nidora to admit that Alden was nice after all. That he’s polite and a genuinely good person. But everything happens for a reason. And maybe, as much as she wanted to let YayaDUB be happy with Alden, “Lahat ng bagay may dahilan.” (Everything happens for a reason). There are still secrets she refused to divulge. And she might die not finding the diary ever again. YayaDUB’s future can also be thrown in as her way of securing her future even after Lola Nidora (as a character dies). Of course, including Alden Richards into the accidental series a.k.a. KalyeSerye meant moments of heart-breaking drama too. While this KalyeSerye may be a parody of your conventional primetime teleserye. the legit heartbreak that comes with seeing your one true love married off to someone else is a nerve that struck the hopeless romantics in Filipinos. The Filipinos’ tender heart is still a tough demographic to satisfy until you make them believe that Alden and YayaDUB would last longer after the ALDUB Fifth Weeksary. Filipinos, not just teeny boppers, want to see this couple be happy. It aroused the hopeless romantic in everyone. It is the kind of love story that every Wattpad writer would love to publish. Also, most women would feel like hugging and comforting someone as hot and manly as Alden Richards when in tears. Men who are in touch with their soft side meant an ability to show emotions. That admission that he needed love and affection too. The kind of man who is motivated to endure any challenge that Lola Nidora would throw his way. As long as he gets to finally meet YayaDUB. And for a man who never saw his lady love in person and cry at the thought of her upcoming wedding to someone else? Every nurturing bone in viewers start sticking out. Everyone has officially found an underdog to root for. ALDUB should go beyond the ALDUB Fifth Weeksary. And everyone would love to see Alden succeed. 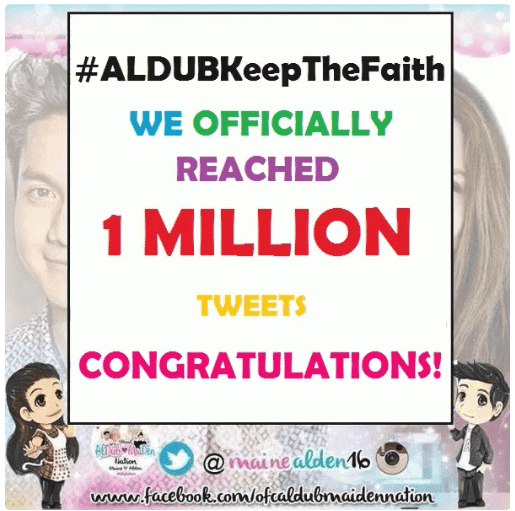 Interested to see the #ALDUBKeepTheFaith episode replay? Like Eat Bulaga’s official Facebook page once it gets uploaded. 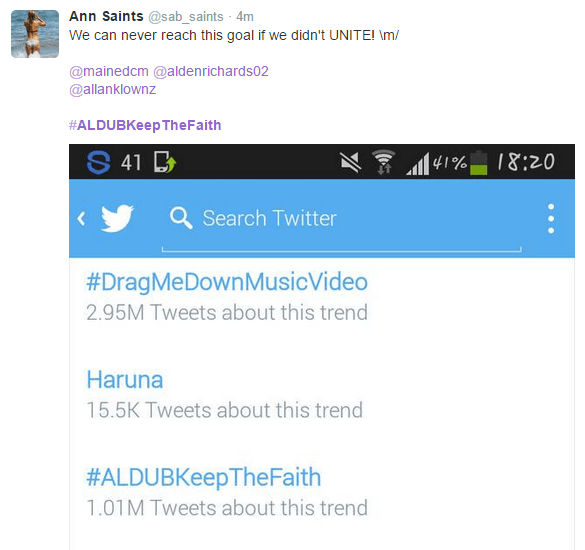 Following Alden and YayaDUB on Twitter would also help in keeping the faith alive after the ALDUB Fifth Weeksary. Follow Alden Richards @aldenrichards02. And follow YayaDUB @mainedcm. Having ALDUB Fifth Weeksary withdrawal symptoms? Too early for that. The wedding is on August 22, 2015. And The Philippines Web would be tuned in as well. So follow us on our social media accounts and let’s connect. Like our officlal Facebook page, The Philippines Web. And follow us on Twitter @pinasamazing. Do it right now!